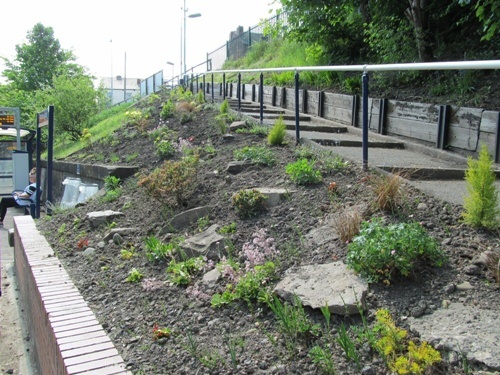 A voluntary project that began in late 2012 and led by local resident and commuter Joanna Parncutt who was aware of a 'friends' group and project which had improved the look of and revitalised nearby Hindley Railway Station. 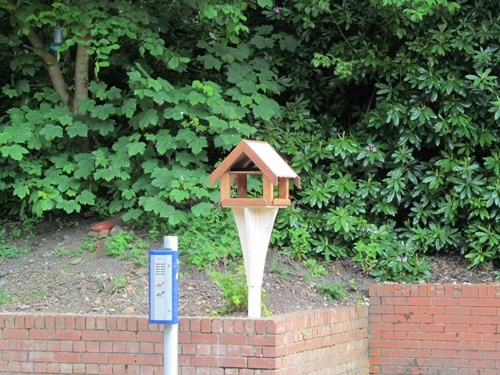 The idea was to bring together local residents and interested parties in an undertaking to improve the appearance and facilities at Westhoughton Station. Such improvements being: tidying up the area; clearing away rubbish; clearing and replanting borders and improving the general ambience of the area for people who use the station. Such a project would not only need willing volunteers to do the work, but also the co-operation of station owners Network Rail and train operator Northern Rail, as work would be being undertaken on private land with health and safety considerations. Initially, commuters were targeted and the authorities approached for an initial meeting held on 21st November 2012 (Minutes) at The Communiversity - a well attended meeting that included a presentation by the Friends of Hindley Station, and showed a good level of support for the idea of improving one of our local stations. The first meeting not only provided impetus to form and constitute the group but also agreed a time for regular work to be done at the station - the first Sunday of each month. 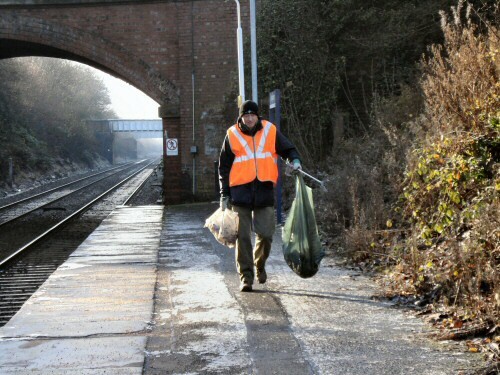 Having attended a safety briefing with Northern Rail, and armed with bin bags, hi viz jackets and a borrowed purple bin down there for recycling cans and bottles, volunteers met up on a Sunday afternoon (2/12/13) for an initial assessment and clean-up. With permission pending from Network Rail to work on the banks, this was followed by another litter pick on Sunday 6/1/14 - litter grabbers borrowed from Bolton Council. The second formal meeting of the group took place on Wednesday 9/1/14 (Minutes) at the Sports and Social Club (Reform Club) to discuss what Friends of Westhoughton Station want to achieve during 2014, how to promote themselves and further involve the community including local schools (invited to provide artwork to fill the blank white boards along the platform). A further clean-up and area preparation session took place on Sunday, 3rd February with the first plants planted. Behind the scenes there have been meetings and contacts with people to help and facilitate the project. Issues such as licensing for access to station property, public liability insurance, funding and resources for administration, materials and equipment, as well as practicalities of doing the work are being addressed as the project takes shape. Additionally, the group has been in touch with local media to raise awareness for the project and cause. Video of initial work at the station produced by volunteer Ted Wisedale. 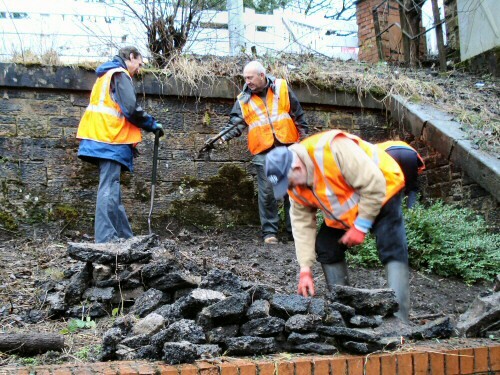 After a phenomenal start and good work done clearing out debris and preparing the borders, planting and adding features to the station, work began again for volunteers; a work pattern of first and third Sunday in the month, with summer Wednesdays - from 10am. From getting a coat of paint on the woodwork, extra litter bins, the removal of a non-working phone, and agreement for an extra waiting shelter on the Manchester side, to removing large amounts of rubbish and debris, and planting numerous bulbs, shrubs and plants. A great difference has been made to the station. Special mention to local businesses – Darby’s, Hardman and Cain, the Pottery Studio, Railway Motors, the Co-Op and Stateside Foods (Video - March 2015) for donating plants, artwork, ceramics and their time to transform the station. Residents and dedicated volunteers have been the driving force to this exceptional project. One of the challenges is working within the confines of sloping banks as opposed to flatbed areas and pathways. 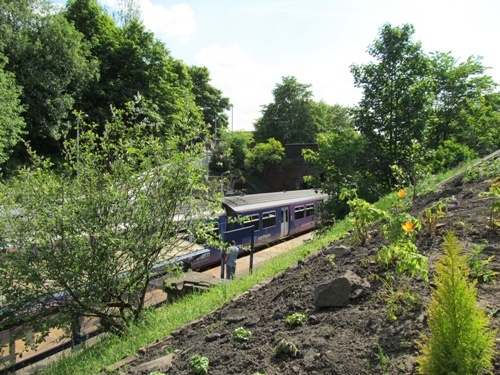 The Friends of Westhoughton Station project has seen much media attention, however, in 2015 it was nominated and was a finalist at the ACoRP Station Awards (1/10/15), short-listed in the best station garden category. Attended by Chair Stephen Freeborn and Ted Wisedale, who presented photos and videos, the group missed out this year (Winners) (PDF). 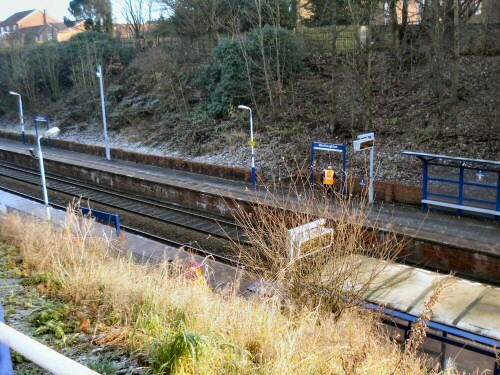 Sunday, 6 December (10am), the Mayor of Westhoughton to present the Friends of Westhoughton with a 'Certificate of Achievement' for all of the work on improving the environment of the station. 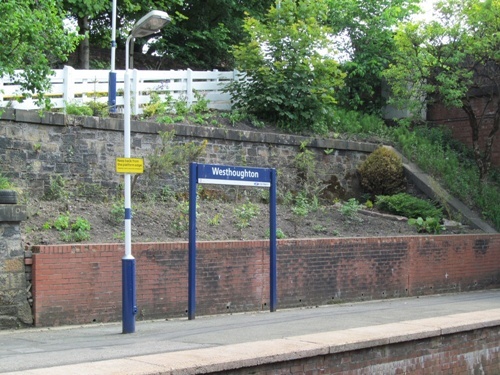 Friends of Westhoughton Station welcomes and is grateful for the help of volunteers, and the support of local business in their endeavours to improve the station. 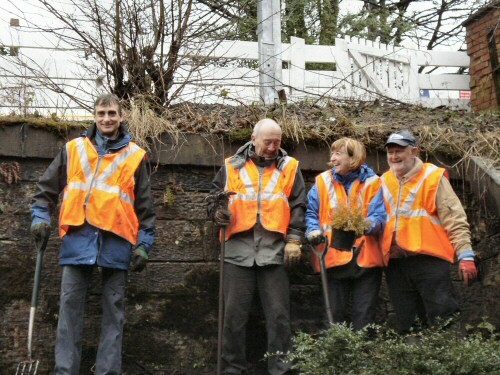 Friends of Westhoughton Station meet regularly and carry out work on site on the first and third Sundays of the month. Main contact: Stephen Freeborn (Chair). For further information call 07970 582472 or email: Friends of Westhoughton Station. They have a group website with all the latest news, pictures and video links showing the progress of the project.